Dog knows “leave it.” Human, not so much. I’ve been meaning to get some pictures of the small flock of Northern Flickers that has been visiting the back field for a week or so, but instead I got flicker feathers. Picked them up from under the big wild cherry tree about an hour ago. Radar is the one who found them, in fact. “Bird,” I said. “Leave it. Back up.” He did. Hm, amazing. Is almost 14 months old the age German Shepherds achieve sanity? A hawk has been hanging around, medium sized, mostly dark brown. That’s who I’m going to peg as the flicker predator. Do other people save pretty feathers? Maybe someone I know will want them. Dear flicker, I’m sorry you died. But your life-force lives on, food for that hawk, and bits of your beauty live on, in this ziplock bag. 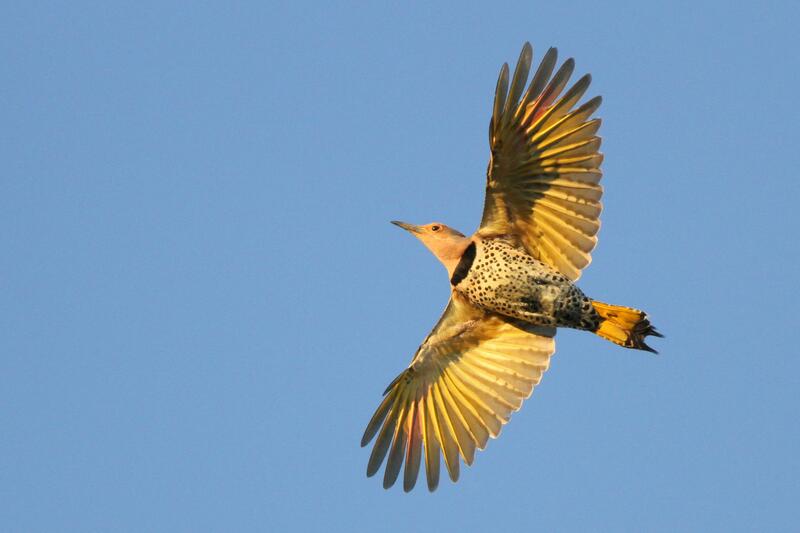 Feather ID… CLICK HERE to see a Northern Flicker in flight. This entry was posted in Uncategorized and tagged birds, feathers, Northern Flicker on September 29, 2016 by Amy.